[Review necessarily contains minor spoilers for the first two books, including endings. I'm as vague as possible, but you shouldn't read this book if you haven't read the first two books. If you don't want to risk spoilers, the short & sweet of it is that this novel wraps up the series well. I affirm & recommend it and the series as a whole]. Not worried about spoilers? Good. We last left Sophie and Agatha separated with their respective beaus from the end of "A World Without Princes." The final installment of "The School for Good and Evil" lacked many of the weird bits that struck me funny from the previous books. Instead we have two strong, powerful heroines trying to figure out what they want from life and who they want to be. The way in which the series wraps up, tying together the girls' pasts and the foundations of their friendship was surprising and fitting. The focus was appropriately back on friendship and the types of non-romantic relationships that shape and influence our lives. A quick complaint: I do not understand Tedros. Is he deliberately blah? I don't buy him as a character that two smart girls would be fighting over, nor as someone who would hold Agatha's interest. I believed Agatha and Tedros most when they were bickering, and less the more devoted to each other they became. Tedros aside, the book's shining moments come from the former stars of story book characters who must face their nemeses again due to Agatha and Sophie's undoing of their story. Cinderella is particularly not-charming as a bawdy, rude woman, whose surprise twist on her background will break your heart. The book felt long and wandering at times, perhaps because I was listening to audio instead of reading. The narration was superb, nonetheless. Verdict: Affirmed. The final installment redeemed the rest of the series and tied everything up in a satisfying, enjoyable novel. 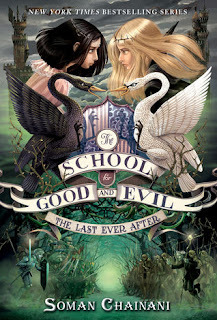 "The Last Ever After" by Soman Chainani, published July 21, 2015 by HarperCollins. Audio narration by Polly Lee, published July 21, 2015 by HarperCollins.